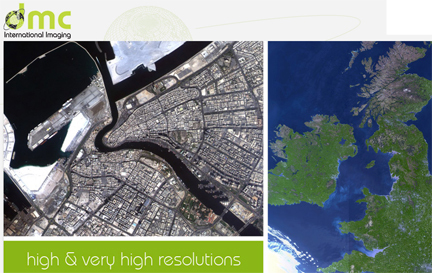 [SatNews] Airbus Defence and Space announced that the data and application services of DMC International Imaging Ltd. (DMCii), UK, will now be available through its Geo-Intelligence program line, further enhancing its Earth observation-based products and services portfolio. With the DMC satellites, Airbus Defence and Space expands its capabilities significantly to what is now the largest fleet of Earth observation (EO) satellites commercially available today—the two DMC satellites alone being capable of acquiring more than 10,000,000 km² per day. The offer of DMCii, a 100 percent subsidiary of Surrey Satellite Technology Ltd (SSTL) which itself is a subsidiary of Airbus Defence and Space, is a natural fit with the company’s geo-intelligence portfolio. With their coordinated DMC satellites, which deliver 22m resolution, 650km swath Earth imagery, DMCii specializes in rapidly programmable acquisition campaigns to meet requirements for up-to-date very-large-area imagery—a valuable expansion to Airbus Defence and Space’s fleet of very-high and high-resolution sensors. The DMCii data and services capacity, now being available through Airbus Defence and Space’s Geo-Intelligence program line, further enhance remote sensing capabilities in the United Kingdom. DMCii, based in Guildford, England, will continue to deliver to its international customers the level of service and expertise to which they have become accustomed. “With DMCii offering large acquisition capacities at 22m resolution, we are able to address the requirements of customers that require regular very-large area coverages and monitoring programs. This is especially relevant within our current primary markets of agriculture, environment and forestry,” said Martin Philp, General Manager of DMCii. “Collaborating with Airbus Defence and Space’s Geo-Intelligence program line will enable DMCii to access the global market for DMC data more effectively and offer customers a wider range of value-added services,” said the Chairman of DMCii and SSTL, Sir Martin Sweeting. Airbus Defence and Space’s Constellation of EO satellites already comprises three sets of satellite twins: the very-high-resolution Pléiades twins, high-resolution SPOT 6 and SPOT 7—spread out on the same orbit with Pléiades and hence guaranteeing daily revisits worldwide—and the weather-independent radar satellites TerraSAR-X and TanDEM-X. The next extension is already on the horizon: In early 2015, the Spanish PAZ (owned and operated by HisdeSAT) is scheduled for launch.